So talk to us about the "Star Wars" toys you had as a kid. It seems like everyone I knew -- at least every boy -- for a certain time period had "Star Wars" bedsheets and pillowcases. But there were plenty of other toys, too, from action figures to replicas of the Death Star to cheesy Halloween costumes to complex playsets that only the rich kid on your block ever owned. My pal Kristin talked to a "Star Wars" expert about his top 10 products related to the franchise. These aren't all old toys though -- the Tauntaun sleeping bag that started out as a joke is in there. Come on, the Darth Vader toaster is the best. I had one of the comics -- I remember it was huge, way oversized, and retold the second part of the movie. I think my mom didn't get that it didn't cover the whole movie, because I never had part one. I was kinda bummed out that I got part two, which did not include my favorite scene -- the garbage compactor. What "Star Wars" items/toys/books/clothes did you have? Or want, but never get? I had the Ewok Village! I loved that thing. I also remember having Chewbacca, Han Solo, Obi Wan, and Princess Leia figurines, and maybe Luke? And some other random ones, maybe Greedo? I was so, so jealous of my friend's Millennium Falcon--it was the coolest. I'm sure I had some other things as well, but the Ewok Village...nothing could top that! My mom was not cool with me getting the action figures, which I desperately wanted. I think she thought that with my love of softball, it would be the final straw on the road to becoming a lesbian. Anyhow, I *was* allowed to buy t-shirts and stuffed animals, so I only ever had Ewoks. 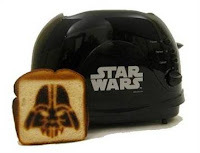 gael: coming soon to williams-sonoma -- star wars cookie cutters, pancake molds and aprons. i predict many, many aprons will be purchased and repurposed into curtains and pillows.